...because any of the end can match perfectly well with any of the starters. ...so that each match is exclusive. The resources in this blog post are based on 16 sentences on the above topic in French. 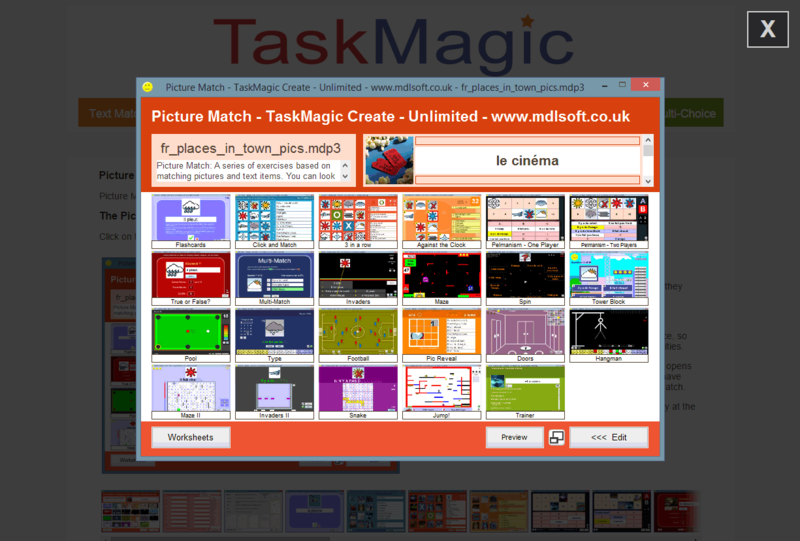 We've recently updated the TaskMagic website to give it a new fresher appearance. 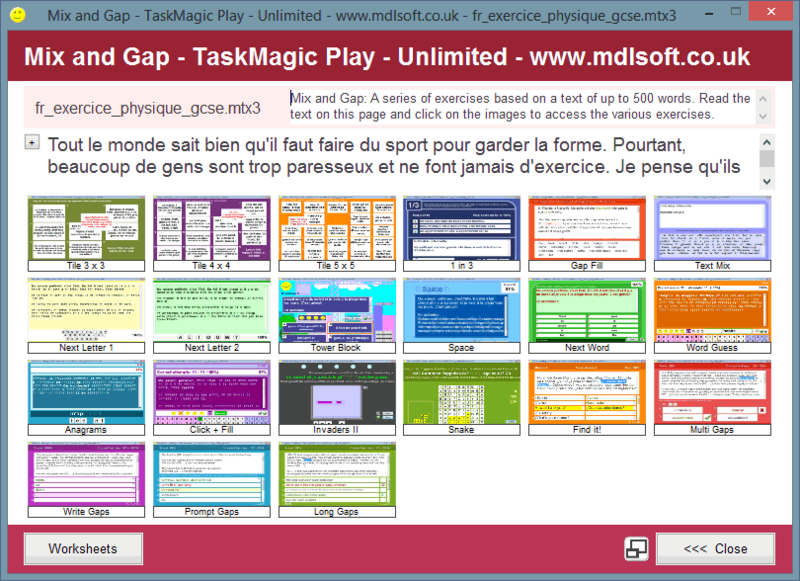 Each of the 8 activity group pages has its own image gallery allowing you to view screenshots of all of the TaskMagic3 screens. Bob est fatigué... - story with HF words etc. pourquoi est-ce que je dois...? The pdfs were printed from TaskMagic3 using doPDF. The TaskMagic3 files are here too: (mtx3=Mix&Gap, see the image above; mdl3=TextMatch). See the resources below -- mostly pdfs plus a TaskMagic3 Mix&Gap file. They're based on a short report of a match between England and Algeria from the last world cup. The report is in the past. The Find-the-French activity contains lots of key vocab for talking about a match in the past. It only takes a few minutes to create your own resources like these based on any text. The resources are based on a description of what happens in the story, rather than on the transcript of the video itself (although some bits of text are taken straight from the video). What age / ability group would be able to cope with this, do you reckon? 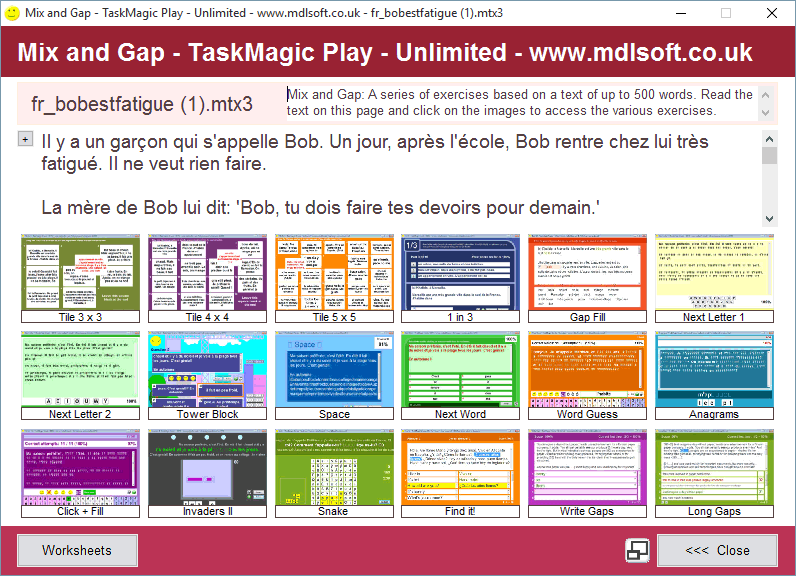 There are 9 pdfs and a TaskMagic3 Mix&Gap file (mtx3 - requires TaskMagic3; provides access to 18 interactive activities), all based on the text. With TaskMagic3 you can create your own resources like these based on any text in a matter of minutes.